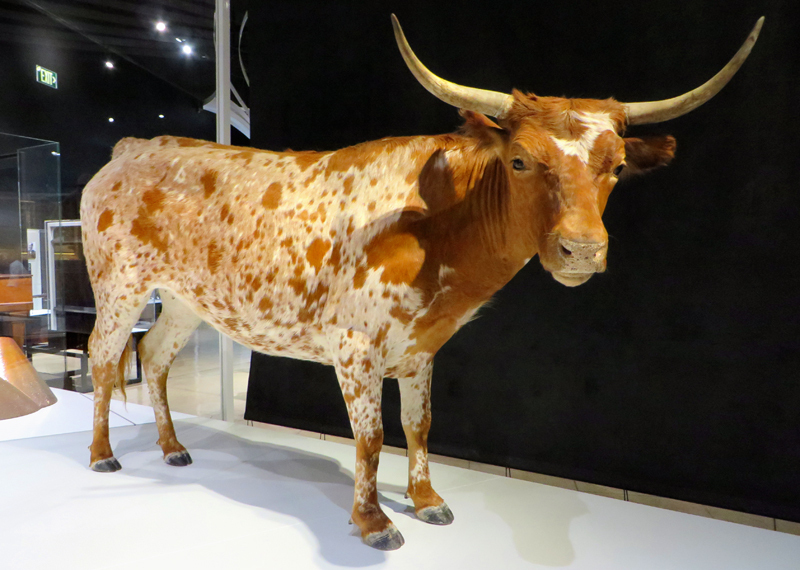 Taxidermied Corriente cow (Bos Taurus). Intended to show what Spanish and Mexican cattle looked like. Now, inner-city kids who've never seen a cow can see a stuffed one. On display in the Natural History Museum of Los Angeles County's permanent "Becoming Los Angeles" exhibit, which opened July 14, 2013. The Black Angus that continue to graze today (2013) on the Newhall Ranch — the old Rancho San Francisco — and the Texas Longhorns on the Tejon Ranch are relatively recent imports. The cattle that roamed the ranchos in old Spanish and Mexican days, and frankly until American cattlemen brought in their fatter varieties of beef cattle, were far smaller and leaner — more like the Corriente, which descends from cattle shipped from Spain the 1500s. Think of a stunted, emaciated Texas Longhorn. When the drought of the early 1860s killed local ranch owner Ygnacio del Valle's herd and ruined him financially, he wasn't looking to sell his scrawny cattle for their beef so much as for their hides and tallow. (Tallow is beef fat, as lard is pork fat.) Tallow allowed there to be light. It was the chief ingredient in candles. It was — and is — also used in certain soaps, foods and lubricants. The Corriente most closely resembles the kind of cattle that roamed the Los Angeles basin in the Mexican era. Cattle were at the center of the rancho (ranch) economy. Cattle products — especially hides and tallow, or cow fat — were traded for tools, fabrics and luxury items. Editor's note: And for money. The 14,000-square-foot permanent exhibition is the largest in the Museum. It tells stories in six major sections: Los Angeles and the region at the time of Spanish contact; the Spanish Mission Era; the Mexican Rancho Era; the early American Period; the emergence of a new American city in the late 19th and early 20th centuries; the Great Depression and World War II, to the present. Some of the stories are well known, such as how the acquisition of water through the Los Angeles Aqueduct in 1913 allowed Los Angeles to grow. But there are other natural and human influences might surprise you: how cattle, the Gold Rush, floods, a plague of grasshoppers, railroads, and outlandish booster campaigns all played a part in transforming the region into an agricultural and industrial empire; the pivotal role Los Angeles played in World War II; and the dynamic diversity of the earliest settlers. Come meet L.A.'s Native Americans, colonists and settlers; rancheros, citrus growers and oil barons; captains of industry, boosters and radicals; filmmakers, innovators and more. LW2528a: 19200 dpi jpeg from digital image 11/23/2013 by Leon Worden.